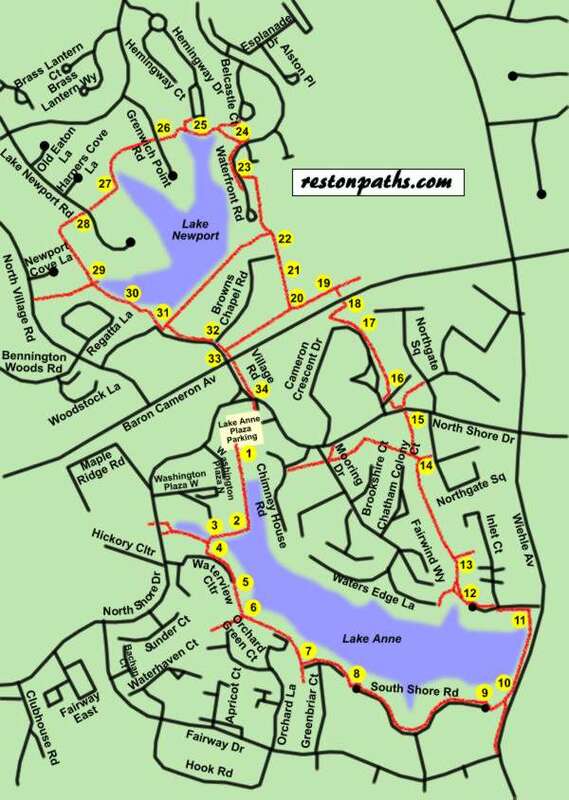 This walk will take you around both Lake Anne and Lake Newport. Note the difference between the first lakefront houses built along Lake Anne and the newest lakefront homes built along Lake Newport. The walk starts from the Lake Anne Plaza parking lot. Walk between the buildings towards Lake Anne. Continue south with the lake on your left towards the Huron House (tall building) on your right. At the end of the plaza turn right and follow the walkway next to the inlet. Turn left and cross the bridge. Continue straight up the hill on the other side. Upon reaching the top of the hill turn left to follow the sidewalk along Waterview Cluster. At the end of the road follow the asphalt path with the lake on your left. Turn left at the asphalt trail intersection. The trail passes in front of homes along the lake. After reaching the end of the homes the trail curves to the right past a dock on the left. After passing a house on the left turn left to follow a sidewalk in front of the homes on Greenbriar Court. Upon reaching the end of the sidewalk take the asphalt trail between the houses to connect to a sidewalk along South Shore Road. Turn left and follow the sidewalk to the other end of that road. Upon reaching the other end of South Shore Road take the asphalt trail between the homes. The trail crosses the dam across Lake Anne. Turn left at the next street intersection (Inlet Court) and follow the sidewalk along that street. Stay straight on the sidewalk and do not take the branch of Inlet Court on the north side of the street. At the end of Inlet Court take the asphalt trail down the hill. At the bottom of the hill take the intersecting trail to the right through the woods and up the hill along the creek on the left. A trail intersects from the right. Continue straight on the trail along the creek. A trail intersects from between the buildings on the right. Turn left towards the covered bridge. Just prior to the covered bridge turn right to continue on the asphalt trail with the creek on your left. The trail enters a tunnel under North Shore Drive. At the other end of the tunnel take the trail to the left following North Shore Drive for a short distance. The trail turns to the right and crosses a driveway into a church parking lot. Continue straight on the trail on the other side of the driveway. The trail reaches the top of a hill and continues through a grassy area on the other side. The trail enters a tunnel under Baron Cameron Avenue. At the other end of the tunnel turn left to follow the asphalt trail along Baron Cameron Avenue. The trail crosses a footbridge. Turn right to follow the intersecting trail up the hill. The trail passes by athletic fields and a picnic area as it goes up the hill. A trail from the Lake Newport dam intersects from the left. Stay straight on the present trail as it turns momentarily to the left after the trail intersection. The trail intersects with Waterfront Road. Cross that road and turn right to follow the sidewalk on the other side. After passing about 5 houses an asphalt trail intersects on the left next to a driveway. Turn left to follow the asphalt trail towards the lake. The trail passes by a short section of Lake Newport on the left. The trail intersects with Grenwich Point Road. Continue on the asphalt trail to the right on the other side of that road. Notice that the trail on the other side is to the right of the driveway directly across from the trail that brought you to the road. The trail goes down a hill and passes by another short section of the lake. It then turns right and goes up a hill between the houses. The trail crosses Lake Newport Road and enters the woods. Upon reaching another section of Lake Newport the trail intersects with another trail. Continue straight on the trail so that Lake Newport is on your left. The trail follows Lake Newport for a short distance. The trail reaches a parking area and a small building on the left. The building used to be the visitor center for Reston. After passing the building turn left to walk up a short flight of steps. At the top of the steps turn right to continue along the asphalt trail next to the parking area. The trail follows the parking area access road and crosses Browns Chapel Road. Continue on the trail to Baron Cameron Avenue. The trail crosses Baron Cameron Avenue. Be sure to press the ‘Walk’ button to get an extended time to cross that road. Walk across North Shore Drive to return to the Lake Anne Plaza parking lot and the start of the walk.